If you’ve come across any of the many media accounts of a consumer uprising against bottled water, you might well assume that makers and sellers of the stuff are on their knees. You might further assume that Fiji Water, which comes from an aquifer in the South Pacific, would be in particularly bad shape: it is a regular target of scorn in those accounts, cited to underscore eco-conscious consumers’ discomfort (or disgust) with something shipped halfway around the planet that also happens to come out of your kitchen tap. Maybe this would explain the brand’s decision to convert pretty much its entire marketing message to: We are an eco-friendly “green” company. But the truth is a little more complicated. The anti-bottled-water-reaction is far more pronounced in the media than in the sales data. Some three billion cases of bottled water sold last year — an increase of 14 percent over 2006, according to Beverage Digest. John Sicher, the editor of that trade publication, says that while that’s slightly lower than prior years’ growth rate (16 percent), this is partly because the bottled-water market has grown so huge. 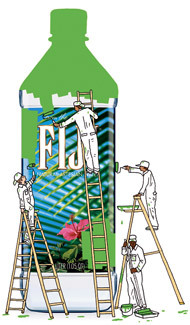 As for Fiji, its sales volume was up 30 percent in 2007, and the company says the brand is experiencing double-digit growth this year. So why has Fiji completely revised its official public image, not to mention increased its marketing budget? The new campaign is anything but subtle. “Every Drop Is Green” is one unflinching slogan. FijiGreen.com brags that the company is actually carbon negative — “The production and sale of each bottle of Fiji Water will actually result in a reduction of carbon in the atmosphere.” (This depends on projects like a company-financed reforestation effort; new trees absorb such gases and thus offset emissions.) “Any time you see negative stories in the press, you have to figure out how to respond,” says Rob Six, Fiji Water’s vice president for corporate communications. The company has made some changes, he adds. Instead of shipping all its U.S.-bound water to Los Angeles and distributing by truck, the company now ships to Los Angeles and Philadelphia, a move that lowered carbon emissions. And it has pledged to further reduce such emissions 25 percent by 2010, through improved packaging and so on. But Six’s most surprising assertion is that Fiji was already an environmentally conscious company — and that’s part of what has been “frustrating” about the media coverage. He points to various conservation efforts in Fiji, and to the fact that the brand’s entire business model depends on the aquifer there remaining pristine. Others, of course, point to another unchangeable aspect of Fiji’s model: getting that water to far-flung markets where people will pay a lot of money for it. Fiji’s luxury-chic status has always been directly tied to the idea that this is a rare substance from an exotic place. Which, in turn, is the issue that enrages its critics. “Lipstick on a pig” was one reaction to its green marketing on Treehugger.com, where a reader poll on the question, “Can Fiji Water Be Green?” was won by the answer “No; it is still ‘fundamentally, inherently and inalterably unconscionable.’ ” On the other hand, Betty McLaughlin of the Container Recycling Institute applauds one facet of the new Fiji: the company says that, unlike most beverage companies, it favors laws that would include water bottles in deposit-driven recycling plans (which usually do not include noncarbonated drinks). That stance hasn’t exactly been at the center of its green-branding efforts so far, but such “bottle bill” efforts are a pet issue for many environmentalists. But it’s probably wrongheaded to see Fiji’s greened-up image as being aimed at eco-opponents. It really speaks to consumers who are conflicted. Not so long ago we all felt good about drinking less soda; do we now have to feel guilty unless we drink tap water? Reid Lifset, the editor of Yale’s Journal of Industrial Ecology, says that bottle bills are a good idea but doesn’t swallow Fiji’s advocacy or other green measures as justifying the practice of transplanetary water shipments. Yet he empathizes with the consumer. “People don’t want to spend their lives wrapped up in ambiguities over one consumption decision,” he says. We want to be told whether something is terrible or perfectly acceptable. Fiji is offering its answer — an answer that, so far, people are still buying. Rob Walker is the author of “Buying In: The Secret Dialogue Between What We Buy and Who We Are,” published this month.